Let me be clear here, this is NOT an announcement post. I AM NOT pregnant. Random Person: How old is he? Random Person: Oh, when are you going to start working on a brother or sister. It’s not that I don’t want another sibling for Mason, it’s quite the opposite, I do. I want three more. Triplets would be nice. Wham, bam thank you m’am and all that. But just because it’s what I *want* doesn’t mean I’m ready for it. But at the same time I can *feel* my biological clock ticking which is absolutely ridiculous. I’m 24. Still young. Especially as far as baby making goes but it’s still something I think about. I also have this crazy intense fear of secondary infertility. What if I can’t get pregnant when I try again one day? Right around this thought process is when Clever Girls offered me the chance to work with First Response: Fertility, I thought what the heck. I might as well try it. Make sure everything is on the up and up. So I did. The test works by having you pee on a stick much in the same way you would a pregnancy test, it even looks like a pregnancy test. In fact when I did it I made sure to go down and tell B “I AM NOT PREGNANT. This is a fertility test that I’m doing for a review”. He shot me daggers and said “Better not be”. After thirty minutes you can read the results. At first I held it the wrong way and almost freaked, I thought my FSH (Follicle Stimulating Hormone) levels were too high which would indicate a problem. Luckily I was just reading it the wrong way and everything is in the normal range since the second line was lighter than the test line. Right now I’m far from thinking about conceiving but it’s still nice to know that if I were I’d be good to go. Now, this test isn’t the say all end all either way whether you have high FSH levels or normal FSH levels but it’s a nice, easy do it at home way to reassure yourself. When it is time to start thinking about conceiving I’ll be taking this test again, just to calm my fears before I start the journey to baby number 2! Disclaimer: I was selected for the post by the Clever Girls Collective, which endorses Blog With Integrity, as I do. All opinions are 100% my own. I may look into getting these when hubb and I decide were ready for baby #4 b/c we typically have problems conceiving. Thanks for the info and sorry for your lost. :/ it might put your mind at ease! and if the levels come out high you can talk to your doctor about it! 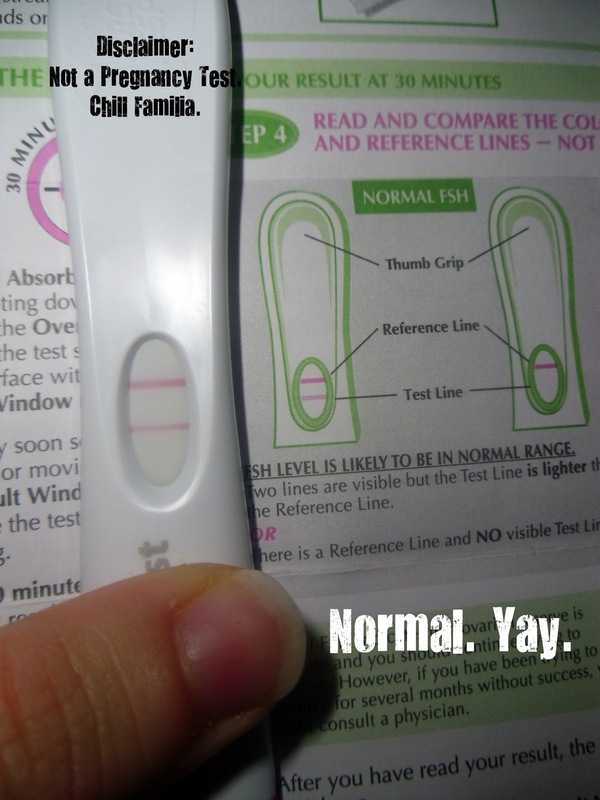 I LOVE how you mention it isn’t a pregnancy test more than once. I’d have to do that too. 🙂 I might have to get one of these when we do try again. Great post! lol if I didn’t I knew I’d get crazy amounts of phone calls from family and friends yelling at me for not telling them but posting it on my blog!! Those are pretty darn cool! I tried one too! Glad mine was also normal. Hoping to be TTCing again in a few more months but not positive. I’m loving life the way it is and finally getting a grasp of things!